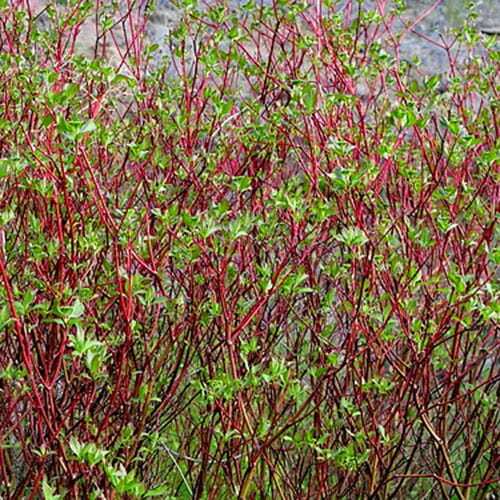 This redtwig dogwood cultivar is a rapid-growing, multi-stemmed, deciduous shrub which grows to a maximum size of 4-5′ tall with a rounded, spreading (stoloniferous) habit. Denser and more compact than the species due in large part to its shorter internodes. The outstanding ornamental feature of this plant is its bright red winter stems which are particularly showy against a snowy backdrop. Tiny white flowers appear in flat-topped clusters (to 2.5″ diameter) in late spring, with sparse, intermittent, additional flowering sometimes continuing into summer. Flowers give way to clusters of whitish (sometimes with a bluish tinge) drupes in late summer. Fruit is quite attractive to birds and is generally considered to have as much if not more ornamental interest than the flowers. Ovate to lanceolate, dark green leaves (2-4″ long) turn an attractive reddish purple in autumn.